Lieutenant Colonel Gordon Francis Edwards was educated at University College School, London, and Charring Cross Hospital Medical School. He qualified MRCS (Eng) LRCP (Lond) in 1937, and MB BS (Lond) in 1938 from Charing Cross Hospital Medical School. He gained prizes in five subjects in the final year, and was made the Llewellyn Scholar as the most outstanding final year student. From 15 August 1937 to 14 February 1938, he held the post of General House Physician, Charring Cross Hospital, and was House Physician to the Children's and Skin Department of the same hospital from 15 February to 30 April 1938. He was also House Physician to the London Chest Hospital from 1 May to 31 October 1938. On 16 September 1938, he applied for a Short Service Commission in the Royal Army Medical Corps. He entered the RAM College Millbank on 1 November 1938 and joined the RAMC Depôt Crookham on 2 January 1939. Lieutenant Colonel Gordon Francis Edwards saw service in field medical units and operational medical administrative appointments in Malta, the Middle East, Italy, France and Germany. He was awarded the MBE in 1942 for his services in Malta during the siege and was twice mentioned in despatches. He remained in the army until 1951, reaching the rank of Colonel and serving as physician to the Royal Chelsea Hospital and at Aldershot. He was one of the first doctors to be trained as a comprehensive respiratory physician. From 1953 to 1958, he was Senior Consultant Chest Physician Leeds. Physician in charge of the respiratory diseases department at St James's Hospital, Senior Chest Physician to Leeds Chest Clinic and the Regional Cardiothoracic Centre at Killingbeck Hospital and lecturer in tuberculosis at the University of Leeds. He took a full part in the multicentre trials, which established effective chemotherapeutic regimens for tuberculosis, and he directed extended research into the optimum use of antibiotics for the frequent infective relapses in chronic bronchitis. 1 Nov 1938 Appointed to a Short Service Commission Lieutenant on probation. Confirmed in rank in March 1939. Malta 6 Apr 1939 Arrived from England. 1939 Married Mary Helen Garner in 1939 and had three daughters. 1 Nov 1939 Appointed Captain RAMC antedated to 1 November 1938. Malta May 1940 Medical Officer in charge Reception Station St Andrews. In May 1940, 500 Naval families were moved into St George's Barracks and 400 Army families into St Andrew's Barracks. E Block St Andrews Barracks was converted into a 60 bed Reception Station to care for the women and children. Powdered milk for the children was in short supply. In July 1940 there were four infant deaths: two from exfoliative pemphigus and 2 from gastroenteritis. There had been 20 cases of gastroenteritis in St Andrews and St George's Barracks in the first two weeks of July. Captain Edwards gave a talk on its prevention to the families. 18 Dec 1940 Took over the medical charge of ADS Tarxien from Major B C Jennings who left for Floriana. 31 Jan 1941 Appointed Acting Major. In December 1940 was appointed by the DDMS to form and command a local Field Ambulance to cover the north of Malta. Moved from MDS Tarxien to MDS Mosta on 24 January 1941 to open the MDS there in skeleton form as did not have sufficient staff. Malta Apr 1941 Senior Medical Officer Malta North with HQ at Mosta. On 26 January 1941, work commenced on the establishment of MDS Mosta, which opened to receive patients on 29 January 1941. On 17 January 1941 Lt Col Rose Gilbert Wolridge OC 161st (EA) Fld Amb took over as SMO Malta South and proceeded with the establishments of the medical units in his area. 1 May 1941–28 June 1944 Appointed Temporary Major. 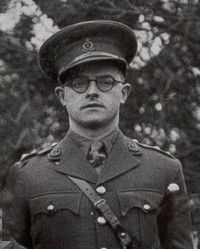 17 May 1941 Temporary Officer Commanding 15th Field Ambulance from its formation until the arrival of Major (A/Lt Col) Thomas Fielden Briggs on 27 July 1941. 15th Fld Ambulance became a self contained unit on 17 May 1941. 25 June 1941 Acting Commanding Officer 45 General Hospital St Patricks. On 1 July took over Pembroke Garrison Gymnasium for the siting of 45 GH. Handed over command of 45 GH to Colonel Frederick Whalley on 27 July 1941. Malta 10 Feb 1942 Exchanged with Major Alan Francis Heber Keatinge MC who became Registrar No 45 General Hospital. Major Edwards took on the role of DADMS HQ Malta which had been occupied by Major Keatinge. Relinquished appointment as Registrar and posted to War HQ as DADS. 10 Feb 1942 Major Edwards's flat in Tigne had been destroyed by a bomb. Malta 2 July 1942 Awarded an MBE in recognition of his gallant and distinguished service during the siege of Malta. 13 July 1942 Two bombs fell in the garden of the house of the Commanding Officer No 90 GH, and another just across the road. A lot of damage was sustained to the office and house of the DDMS and Major Edwards sustained minor injuries. Apr 1943 Left Malta for the Middle East. 1 Nov 1943 Appointed to a Permanent Regular Army Commission Captain RAMC. 1943–1944 Served with the Middle East Force. Served in North Africa (Central Mediterranean Force). 3 Jan–9 Oct 1945 Appointed Temporary Major. 10 Oct 1945 War Substantive Major. 1945–1946 Assistant Director of Medical Services HQ Lines of Communication 21 Army Group. 10 July 1945 Acting Lieutenant Colonel RAMC. 10 Oct 1945–29 June 1946 Temporary Lieutenant Colonel RAMC. 1946–1948 Physician and Surgeon to the Royal Hospital, Chelsea. 1946 Assistant Director of Medical Services HQ 21 Army Group. 1 July 1946 Promoted Major RAMC. Graded Physician. 1948 Chest Physician Connaught Hospital. 29 Aug 1949–21 Nov 1949 Temporary Lieutenant Colonel RAMC. 1951 Senior specialist in medicine. 2 Nov 1952 Retired with a gratuity and was granted the honorary rank of Lieutenant Colonel. Appointed Senior Registrar Bedford Hospital and Clinical Assistant Brompton Hospital. 1952–1955 Officer-in-charge Medical Division 26 General Hospital. Jan 1953 Major (Honorary Lt Col) G F Edwards Army Emergency Reserve was granted the Acting rank of Lieutenant Colonel RAMC. Apr 1954 Major (Acting Lt Col) G F Edwards Army Emergency Reserve was promoted Lieutenant Colonel RAMC. 26 Sept 1955 Granted the Acting rank of Colonel L/RAMC Army Emergency Reserve. 3 Sept 1956–11 Dec 1956 Rejoined the service. 31 Oct 1961 Reverted to Regular Army Reserve of Officers and ceased to form part of the Army Emergency Reserve. Retained the rank of Colonel. June 1964 Relinquished his Army Emergency Reserve of Officers commission. 1 May 1996 Lived near Harrogate. Died of a heart attack. Entry No: 1688. Drew R. 1968. Commissioned Offices in the Medical Services of the British Army 1690–1960. Vol. II. Roll of Officers in the Royal Army Medical Corps 1898–1960. London: Wellcome Historical Medical Library. Obituary, Br Med J (1996); 313:164 (Published 20 July 1996). TNA:WO 177/700, War Diaries 15th Field Ambulance RAMC April 1941 to April 1944. TNA:WO 177/1287, War Diaries No 45 General Hospital May 1941 to Apr 1946. TNA:WO 177/114. Medical Diaries MDS Mosta March 1941.